School hours are from 7:50 am until 2:45 pm. 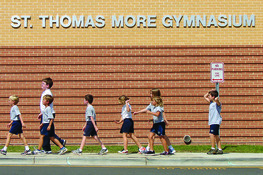 for grades K-8, 7:50 am until 11:30 for Pre-K. St. Thomas More Catholic School does not assume responsibility for students before 7:30 am or after 3:10 pm. Any minor must be accompanied by an adult if on campus outside of normal school hours. In order to increase safety for our students, drivers may not use cell phones at any time while driving on St. Thomas More School property. Parents wishing to walk with their child(ren) into the school during the arrival time, or pick their child up at dismissal should park in the Church parking lot and walk along the sidewalk to the school. NEVER SEND CHILDREN WALKING ACROSS THE DROP-OFF CAR LINE. If you are arriving after 7:50, you must walk your child into the school and sign them in via the computer. Parents should not walk their child down to the classroom after signing them in. If you feel your child needs assistance, please let someone in the office help. School activities begin promptly 7:50 am: All students must be in the gym at this time. Safety Patrol students will help your child out of the car each morning. The Pre-K children will be escorted to their teacher by a Safety Patrol Student or sibling. As in the morning arrival ENTER OUR CAMPUS AT THE TRAFFIC LIGHT AND BEGIN LINING UP ON CARMICHAEL STREET. From there, follow the same traffic flow as morning Arrival. Parents who park up at the church and walk up to get their student may wait outside the school until students are dismissed. *The elementary building has a covered area between the new gym and hallway for parents to wait for their children. Drivers should display family or carpool name signs in the front window. Students must bring a note if they are being picked up by someone other than their parent or regular carpool. Students not picked up by 3:10 will be taken to the Aftercare Office. Aftercare is located to the left of the stage area in STM Hall/Dining Hall, in the elementary building. A fee of $1.00 per minute will be billed via the family&apos;s FACTS account, for students who are not registered for the Aftercare program and are picked up after 3:10.